If you're anything like me, your computer has become a digital shoebox: a place to store a photo, where it sits on my hard drive, accumulating the digital equivalent of cobwebs and dust. Enter Fotobounce. This free (though ad-supported) application is designed to help shake the dust and cobwebs off your digital photo collection, by organizing and helping you share your photos. It offers some pretty nifty features, but also suffers from a few glitches. Fotobounce offers facial recognition technology that is supposed to learn to identify the faces in your photos automatically. Once installed, Fotobounce will find your photos in the locations to which you direct the app. The company says its organization features are "people-centric" and, as such, the app's key feature is its Face Recognition Technology. It's designed to (with a little training, of course) learn to recognize the faces that appear in your photos. 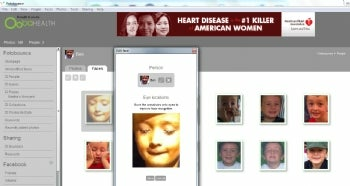 It automatically finds faces in your photos, and you can tag people to identify them. Once you start tagging people, Fotobounce is supposed to learn their identities, and should begin identifying them for you. The facial recognition didn't always work as advertised, however. I tested the app with a library of about 200 photos, most of which contained the same three people. I went through many of the photos, tagging people and using the app's "Eye locations" system, which allows you to identify the locations of eyes in photos in order to improve facial recognition, but I was still disappointed with the results. Fotobounce was successful in identifying faces less than 50 percent of the time in my informal tests. Luckily, you can easily reject its suggestions and apply your own tags instead. Fotobounce allows you to share your photos in several different ways. You can connect the app to your Facebook or Flickr accounts to upload your photos or albums, and it will keep your tags intact. When you link Fotobounce to your Facebook account, it will import a list of your friends, and allow you to tag them directly in any photos in your Fotobounce library. In addition, the app allows you to share photos directly with friends via a private peer-to-peer connection that the company likens to "Skype for photos." To do this, you send invitations to people you'd like to add as "Bouncers"; they, in turn, will have to install Fotobounce on their computers in order to see your photos. I sent invitations to several potential Bouncers, but none of them actually received the invitation via e-mail. All of them checked their spam or junk mail folders to see if the invitation had been misdirected, but in all cases, the invitation was never received. The tech support folks at Fotobounce looked into this for me, and discovered a bug in the application. They say it will be resolved in the next release. Fotobounce also lets you view your photo collection from a mobile device with a browser, such as an iPhone, iPod Touch, or a BlackBerry. You do this by setting up a username and password in the desktop version of the app, and then pointing your mobile browser to Fotobounce's mobile URL. From here, it's easy enough to browse through your photo library, but I found the interface somewhat inelegant. I tested Fotomobile on an iPhone 4, and was disappointed to see that my photos never filled the phone's screen. Instead, they were small and sometimes displayed off-center. I like Fotobounce as a free photo organizer: in addition to organizing photos by person, you can sort them by date and place. It makes scrolling through a large photo collection a snap. I'd like to see the face recognition improve, however, and if the photo sharing features worked as advertised, I could recommend Fotobounce without hesitation. Unfortunately, that's not the case right now.